Logins this hour: 17178 ? Some days on the schedule may need extra attention. You can now highlight important events, deadlines and other special dates. Add highlights one day at a time or on a repeating basis. Each color can have a brief text label. 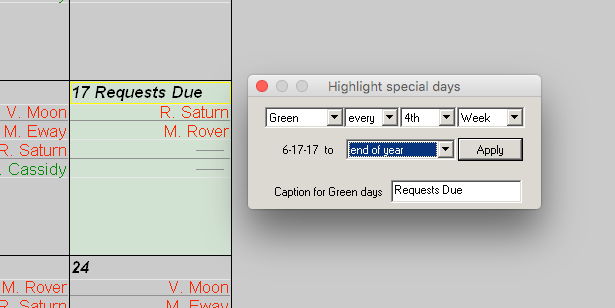 Right-click on any date and select a color. Choose Special Day Highlight... to repeat over a number of days or every Nth day or week and to add a caption. Special Days went into OnCall in June 2017. If your software doesn't have the feature, open OnCall and go to Help / Update OnCall. Be sure to update the software on any computer where you or a colleague edits the schedule. Earlier versions of OnCall will not load or save the highlights.